Culture Bore: Some Thoughts On "Pro-Islamic Bias"
"Without a doubt, social studies and science textbooks oftentimes find themselves at the crossroads of our nation's cultural wars," said Jay Diskey, executive director of the Association of American Publishers' School Division. Most book companies create independent internal bias reviews "because they know it does them no good to produce things that are inaccurate and biased," Diskey said. The books cited in the resolution currently are not used in Texas schools, Diskey said. 1. 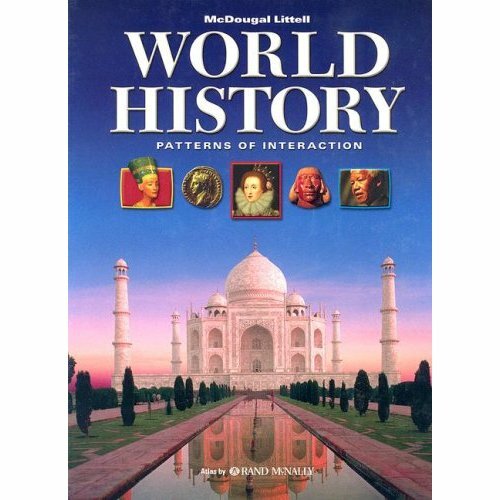 World history in a nutshell: people did horrifying things in the name of ____, people did beautiful things in the name of ____. Just figure out what things influenced what events in what proportions, and you're most of the way there. So if enlightening cultural contributions and mass slaughter have both happened the name of Christianity, as well as Islam, then the history textbooks should reflect the murky, mixed, complicated, multi-sided, multi-causal nature of what actually happened to begin with. 2. In a way, this can be seen as an overall attack on perceived political correctness in education - the idea that the "liberal" history textbook writers want to shove foreign religions and ideas down American children's throats to make them more tolerant of everything except their own American heritage. This has been a storyline amongst American conservatives for decades. And it's not completely baseless - you could argue that some historians like Howard Zinn intentionally attacked the "heroic" conception of American history to the point of making America as whole look more bad than good to the point of over-emphasis. But the Texas School Board's recent rhetorical change of the "slave trade" to the "triangular trade", as well as the downplaying of Thomas Jefferson in favor of John Calvin shows that historical bias can go in any direction - even as an overreaction to a perceived overreaction to the way history was taught in America. There is, after all, a difference between correcting bias, and substituting one's bias for another bias. anti-Islam: "Apologist liberals ignore militant aspects of the religion's history and holy texts, and downplay/ignore the concentrated efforts of networked Islamist groups to undermine Western power and society for the sake of Islam. Most public moderate Islamic groups are propaganda fronts for those who want to impose sharia law, and the politically-correct are too blind to see this "stealth jihad". Islam imposes itself on others more so than other religious traditions, therefore it should be given more scrutiny than other religious belief systems in the United States. Defenders of Islam are destroying Western civilization and letting more and more Muslim immigrants into Western countries will eventually turn the societies into hardline Muslim societies in a few generations...a few bad apples ruin the bunch and group discrimination is justified." anti-anti-Islam: "Religion is personal, all anti-Islamic bias is racist xenophobia from dumb white Sarah Palin-loving rednecks, not every Muslim wants to impose sharia law on the United States and the ones who do are radical extremists that don't represent the majority views, Islam is subject to personal interpretation, 1st amendment guarantees it's practice, conservative politicians and pundits are using Islamophobia to scare people into voting Republican for the midterm elections, Islamophobia in Western countries will be used by hostile regimes in majority Muslim countries as propaganda and undermine the wars in Afghanistan and Iraq. People should be judged as people and not their religious beliefs and perpetuating anti-Islamic fears in America tears apart social cohesion and increases discrimination against innocent people...a few bad apples don't ruin the bunch and group discrimination is not justified." pro-Reality: some Muslims want to "destroy the West", some are content to live their own lives. The number of Muslims who want to carry out Jihad is significantly large to be a political and security concern, but proportionately small compared to the roughly 1 billion Muslims across the world. Anti-Western Muslims and Anti-Muslim Westerners are both going to spin past and current events into their own storylines to appeal to their supporters in order to keep their movements alive and achieve their goals. Most people just want to be left alone and engage themselves in their day-to-day lives. Too bad this debate isn't going away anytime soon.